Classical Trax is a music forum, online community and family run by Matt Lutz. CT are doing so much good for new and upcoming electronic music, promoting it online and in clubs, where it belongs. 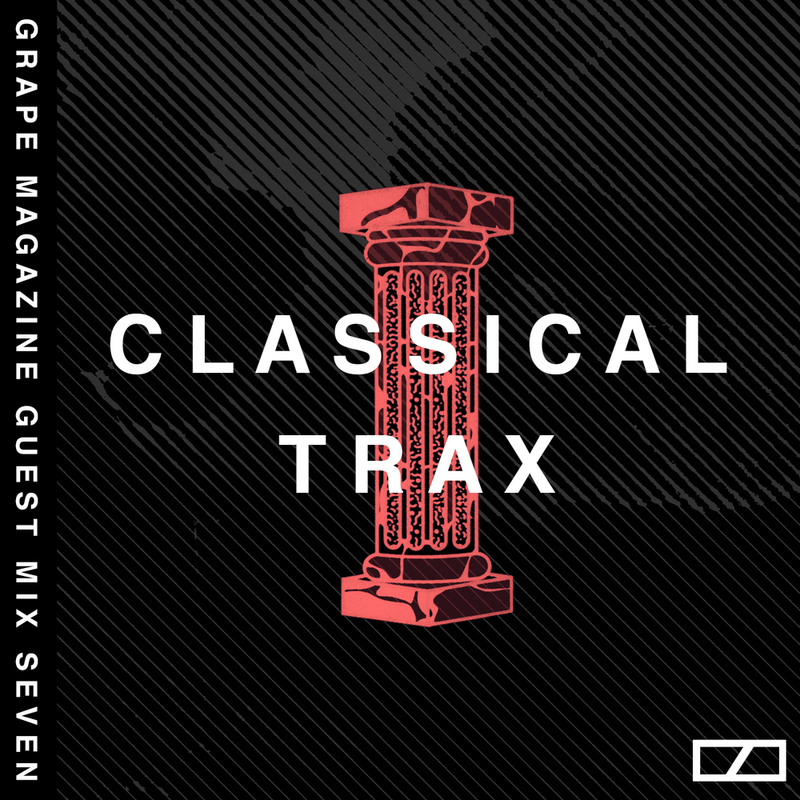 As well as putting out regular features all the time and recently starting their new Radar Radio show, Classical Trax also just put out Architecture, a two part compilation featuring a host of incredible, new artists that you should definitely know about. We're very happy to have a guest mix from Matt and to get to hear a bit about what goes on behind the scenes at Classical Trax. Enjoy the mix and interview below and go join the fam on soundcloud now. For those who don't know, what is Classical Trax? Classical Trax, is a community where people from all around the world gather to talk about club/dance/other things ...in an honest and positive way. Classical Trax got started with myself, mainly really being into club music through things like dubstepforum, grime forum, hollaboard and blogs. I also was really heavy into labels like DFA, Night Slugs and Butterz among many others. I felt like their wasn't a place where people could talk about this stuff, and I felt like magazines, websites overall don't do a good job of covering the little guys. Classical Trax is trying to change that and it may never happen but we are working to push this sound and these global artists. How important are online communities for creatives? Why? I believe in this day in age they are important but if your sole idea is to be online you are going to miss on what exactly club/dance music is all about. I would be telling a lie if I said online communities aren't crucial because obviosuly they are but we have to make sure as artists, deejays, writers, producers we don't become detahced with the physical, elements of going to see the people play, buying merchandise and talking with people even if its email, messages what have you. Why did you start your own? I started my own because I don't think enough of these communtiies existed where people were doing things for a good reason. I felt like to many groups, communties were done out of ideas for self promotion and not everything was done in a positive way. I am not saying what CT does is perfect and we haven't always gone about things the best way possible, but we are learning and the main thing I want to preach is doing things from a positive perspective, supporting the people that support you and not appropiating cultures or scenes. With all the new streaming services and the constant cracking down of fun on Soundcloud, what do you think is the future of online music platforms? I can't answer this to be honest, because sadly I use soundcloud quite a bit and if it wasn't soundcloud I am not sure we would hve gained the same exposure because it allowed us to host our releases and such. I do think bandcamp is something people can really use more and I think things like hulkshare, mediafire and mixcloud really need to do a better job. My main issue with soundcloud is taking down mixes we have for using older tunes, just because they are from a certain label. What are some of your favorite things that have come from starting CT? In terms of artists? Wow, so many artists are doing amazing things and taking sounds and just flipping them into their own, producers/Deejays like Blastah, GIL, ZutZut, V Geels, City Fitness, Staycore Crew, Nervous Horizon, Morten HD, Dellity, PTP (out to Geng) Supraman. I also think the collabs which are starting to happen, they're amazing because you are seeing producers take ideas and flip them or even the different genres and sounds people are putting into their mixes are amazing. Who or what are you into right now? I am into so much at the moment it will probably scare people away but right now.. GQOM is huge thing I have been listening to lately, and I love that labels like Gqom OH, Private Selection and Goon Club All Stars are starting to push these artists into releases. What's in store for CT in the future? A lot of stuff...I always say to people, never voice your vision..because people are always lurking. But I can say we have some cool plans, a couple cool collab comps, a cool platform idea we have and are putting in progress as well a few more things in house from producers. How have you found being a USA born grime fan? I discovered grime in 2003/2004 when I was using this computer stream thing(real player) and they kept recommending this guy called Dizzee cause I was listening to weird rap and I was like yea never heard of UK rap. Then i saw a article about him or something in a magazine, and bought the cd and boom I was hooked. I also loved the early Run The Road comps. Do you think the "grime takeover" of USA that is going to happen? haha I am not a grime expert, but I don't it will..I think people will try and thats cool because I love grime and I want everyone to get it but I just think hip-hop is king and in the states people don't like everything they hear and can't understand. But thats just my two cents.